Although the cuisine is often described as simple and the ingredients for most dishes are fairly basic, the food culture of Scandinavia offers visitors a unique chance to enjoy meals that have been perfected over thousands of years and influenced by Nordic and Viking traditions. Contrary to popular belief, Scandinavian cuisine isn't limited strictly to fish. Dishes found across Norway, Sweden, Iceland, Denmark, and Finland are made with a variety of ingredients sourced from the land and sea. 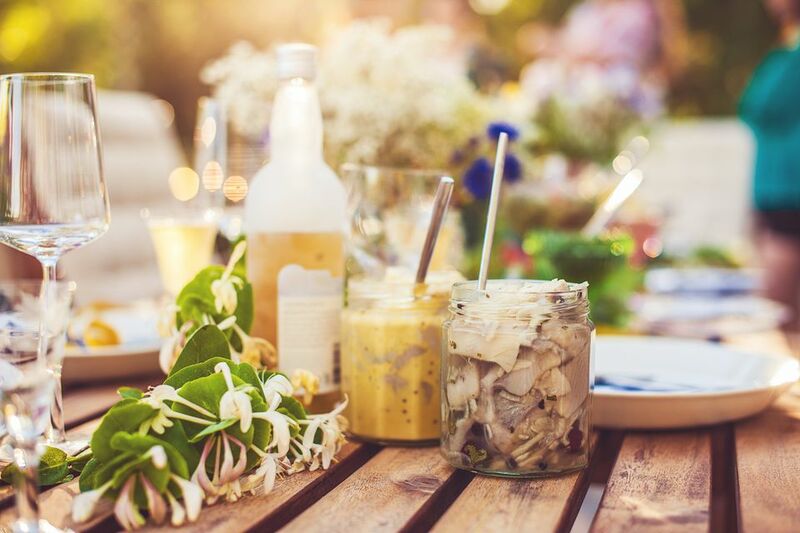 Known locally as husmanskost ("farmer’s fare"), you'll find dishes featuring beets, potatoes, cucumbers, and apples paired with a wide variety of seafood, pork, poultry, and beef. Like typical Scandinavian designs, though, cooking in this region sticks mostly to the basics, but there's a bit of Scandinavian history behind each dish. For instance, the Vikings' meals almost always included oysters or mussels and occasionally featured mutton, cheese, cabbage, apples, onions, berries, and nuts—all of which can be found in many local dishes today. Scandinavia stretches across northern Europe, bordered to the north by the Barents Sea, Greenland Sea, and the Arctic Ocean; to the west by the Norwegian Sea and the Atlantic Ocean; and to the south by Estonia, the Baltic Sea, Poland, Germany, and the rest of central Europe. Since the time of the Vikings, Nordic people have lived off the land, sea, and lakes, and traditions from different cultures still influence cuisine today. In most of Scandinavia, a large portion of food does come from the sea—such as Norwegian whale steak—so you'll typically find fish as the least expensive entree on menus across the region. Along with seafood, most Nordic menus include deer, elk, reindeer, and bear meat as entrees, and cured fresh-water salmon is a local favorite in Norway or Denmark. However, if you're feeling a bit more adventurous, some restaurants in Sweden serve "hamburgers" made out of smoked horsemeat, and the midwinter feast in Iceland called Thorrablot features a spread of some truly unique menu items. It's quite common in Scandinavia to prepare meals with more salt than in most other parts of the world. In order to keep fish and meat fresh during long, dark Scandinavian winters, locals have practiced smoking and salting their food for hundreds of years. Scandinavian cuisine includes the Swedish, Finnish, Norwegian, and Danish food traditions. Since these countries are grouped together geographically, many of the country's culinary cultures are quite similar. Still, there are some unique dishes you'll only find in certain parts of the region. Denmark: Fish is king in Danish cuisine. Cod with mustard sauce and boiled potatoes (torsk); open sandwiches with rye bread topped with various meats, egg, and a spicy sauce (smorrebrod); and a variety of confectioneries—like the ring-shaped multi-layer cake made of marzipan called kransekake—are among the unique dishes you'll find here. Norway: One of the most popular fish in Norway is the Norwegian herring, an inexpensive fish that's used in a variety of dishes due to its large population in the nearby Norwegian Sea. Other popular fishes include stockfish and clipfish, both of which can be attached to sticks and stood up to dry. The national dish of Norway is also a dried fish called lutefisk, which is put in a special liquor made of birch ash and served with bacon, potatoes, and a puree of peas. Sweden: Swedish cuisine involves a bit more red and white meat than Norway or Denmark, though fish is still on the menu at most establishments in the country. Meatballs called köttbullar and minced pork are among the favorite dishes. A particular specialty of Sweden is elk meat, which is very low in fat and is used in goulash or steak. Finland: Finnish cuisine often involves reindeer meat, a fruity cloudberry sauce, and fresh chanterelle. Also very popular in the region are dumplings filled with salted rice pudding called pierogis. Wherever you go on your trip to Scandinavia this year, be sure to ask around when you arrive for what dishes you simply can't miss. With so many unique and delicious Scandinavian meals to try, don't be afraid to try something you never would have ordered at home. After all, with so many years of history behind every dish, there's got to be something great about every meal.